This reverend of the Church of England has written that they owe Darwin an apology for the way they reacted to his theory of evolution. 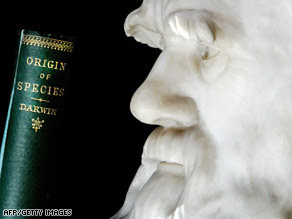 Brown said the Church of England should say it is sorry for misunderstanding him at the time he released his findings and, "by getting our first reaction wrong, encouraging others to misunderstand (Darwin) still." He goes on to say that evolution is not atheism, as most atheists already knew. He said he opposed Christians for whom "evolution is equated with atheism" as well as Darwinists who felt ideas about evolution "completely undermine any kind of credibility for God." "That's completely wrong," he told British Broadcasting Corp. radio. "It's a false polarization." The Anglican Church has no problem with evolution, the Catholic Church has no problem with evolution, etc. The only ones who seem to reject evolution so forcefully are the fundamentalist Christians (mostly in the US and A) and the fundamentalist Muslims. Those two groups have much more in common than they realise. Sorry, the truth is nobody typed this, it evolved onto the screen all by itself. Wow, another fool with absolutely no idea of what evolution is or how it works. It's hard to learn about evolution from your preacher. Try this experiment. Just cut off one of your hands. Then sell everything you have and give the money to the poor. Then pray really, really hard for your magical sky fairy to grow your hand back in return for your good deed. As usual, there will be no answer. But why is that? The magical sky fairy can do anything, right? Could it be that..... it ....doesn't exist?